Referred to as ‘the wedding cake’ by many a resident foreigner, the Shanghai Exhibition Center is the ornate monolith of Soviet splendor steadfastly sprawling across an entire city block between the Yan’an Lu elevated highway and Nanjing Xi Lu, and the The Portman Ritz-Carlton. A classic example of Stalinist architecture, construction was completed on March 5, 1955, with the assistance of the Soviet Union. It followed on from the Sino-Soviet Treaty of Friendship and Alliance, that was ratified in 1945, but only made public in 1950 following Liberation the previous year. 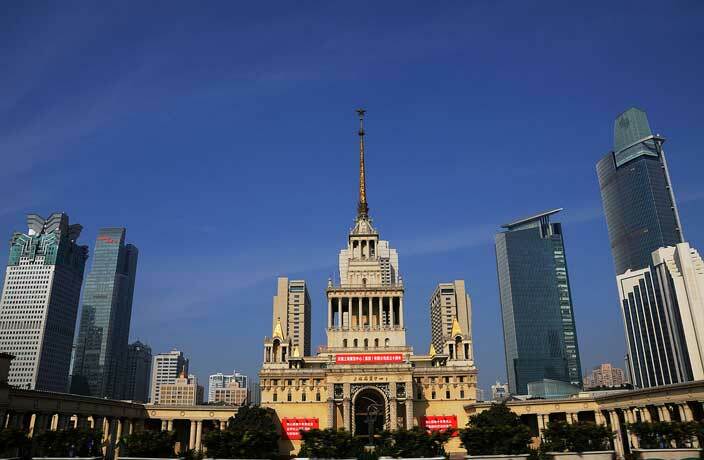 Originally named the ‘Palace of Sino-Soviet Friendship,’ the building was intended to showcase Chinese advances in agriculture and industrial technology during the ‘Bamboo Curtain’ era. But once the honeymoon period between the People’s Republic of China and the Soviet Union was over, and relations began to sour, the building was renamed. The building was called the Shanghai Pavilion during the Cultural Revolution, before being given its present name during the period of Reform and Opening-up. And there it still stands, remaining in use as an exhibition space, one of the most iconic buildings in the city, in all its unsubtle, ostentatious and monumental glory. With its bold Bolshevik strokes and its gilded spire topped with the Soviet star, it stands testament to the ties between the two countries, their shared history and the influence the Soviet Union once enjoyed here. This article was originally published in March 5, 2017. It has been updated and republished on March 5, 2019. The ringroad-encircled apartment building now houses just two residents.